The Berklee Oral History Project (BOHP) aims to chronicle the rich and diverse history of Berklee and Boston music from those who have lived, shaped and defined it. Established in 1998 by the Stan Getz Library, the collection now forms a part of the Berklee Archives and numbers over 90 video interviews, many of which are available online: https://archives.berklee.edu/bca-011-bohp. This initiative has been highly collaborative from the start and is ongoing: we’re always on the lookout for additional interview subjects, are very much in need of interviewers, and welcome assistance with the transcription process. BOHP interviews are typically 90 minutes long and topics include jazz history, music education, the Boston jazz community, and the early development of the Berklee College of Music. The final videos are transcribed and posted online as part of the Berklee Archives’ digital collections: https://archives.berklee.edu/bca-011-bohp. 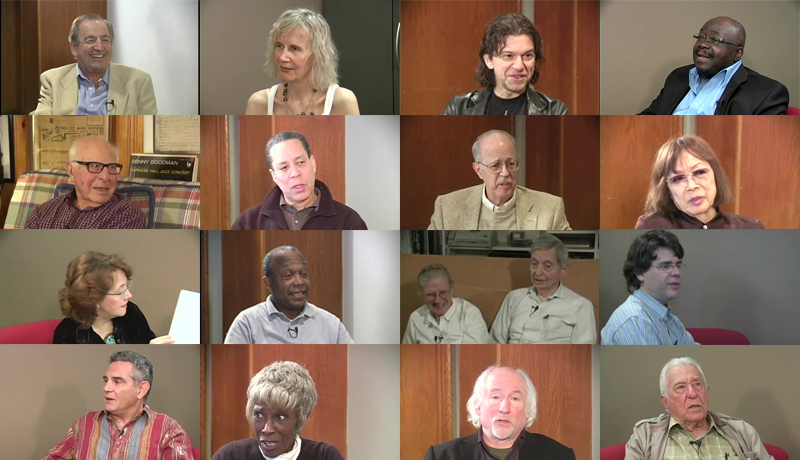 A finding aid (descriptive inventory) for the Berklee Oral History Project is also available online, and includes brief biographies of those interviewed: https://archives.berklee.edu/_archives/archives_content/FindingAids/BCA-011_BOHP.pdf. Lest the list and links fool you, the Berklee Oral History Project is far from a finished product, ready to be shelved for posterity. This is a living, breathing collection, constantly in need of subject experts and fresh perspectives to make sure a diverse range of voices is heard and recorded on an ongoing basis. How can you help? Contact us: who should we interview next? Join us: become an interviewer! We can’t do it alone and we welcome participation and feedback from faculty, staff, students, and alumni alike. One final note: the Berklee Oral History Project collection forms part of a larger set of materials documenting the history of Berklee College of Music and its cultural context, all under the purview of the Berklee Archives. Established in 2012, the Berklee Archives documents Berklee’s history, activities, and contributions, with additional special collections in jazz and popular music. Digital collections, including the BOHP, may be accessed online at all times: https://archives.berklee.edu/digital-collections. Descriptions of all archival collections open for research are posted online (https://archives.berklee.edu/research/finding-aids) and are available by appointment in room 297 of the Stan Getz Library (off of the Quiet Reading Room). For more information on the Berklee Archives and/or the Berklee Oral History Project, please visit archives.berklee.edu, email archives@berklee.edu, or give us a call at 617-747-8001. We look forward to hearing from you!